How does technology impact loneliness? This was the central question for the Show Floor Showdown, an event hosted during the 2019 Gartner Data & Analytics Summit. 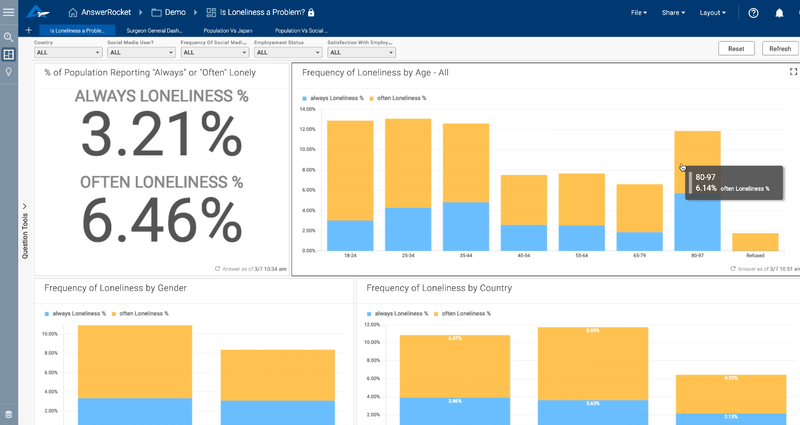 In this event, six analytics software companies were invited to demo their products in a 10-minute presentation aimed at uncovering correlations between technology and loneliness. AnswerRocket was honored to be one of the lucky six. Prior to the Summit, Gartner presented each company with data from the Kaiser Family Foundation, the Economist’s survey on loneliness, and Gartner’s Consumer Values Survey. We were tasked with preparing and structuring the data for analysis within a timeframe of two weeks— a challenge we were eager to take on. From there, we used AnswerRocket’s advanced AI and machine learning features to dive deep into the data. AnswerRocket SVP Pete Reilly presented our findings during the Show Floor Showdown to a crowded room of AI enthusiasts. We were thrilled with the engagement we received around our software, and more so, we were excited to contribute to an important conversation around such a pressing and timely issue as loneliness. Who is most affected by loneliness? Curiosity is at the root of discovery, so we began our data dive by asking questions. “What is the frequency of loneliness by age” >>> We discovered that ages 25-34 reported the most loneliness (~13%), with ages 18-24 and 35-44 close behind. Loneliness spiked again at ages 80-97 (~12%). “Frequency of loneliness by gender” >>> Females tended to be lonelier than males by ~2%. “Frequency of loneliness by country” >>> Based on data from the USA, the UK, and Japan, we learned that loneliness was highest in the UK, followed by the USA, and then Japan. We found it interesting that millenials ranked highest for loneliness, considering the attention paid to loneliness in elders. Additionally, the disparity between loneliness in each country caught our eye. Even though Japan ranks lowest in loneliness, almost 50% of respondents in Japan considered loneliness to be a major problem, whereas only ~20% of UK and US respondents thought the same. Only ~20% of Japanese respondents reported being “Very Happy” compared to ~50% of US respondents. This information added more context to the original demographic data and reminded us not to jump to any conclusions. Data, after all, is complex, and software like AnswerRocket is well-poised to direct us away from our biases, assumptions, and tendencies to read correlations as causations. Plus, this was only part of the story — we hadn’t yet discussed the role of technology’s impact. How does technology impact loneliness…in our perceptions vs. reality? 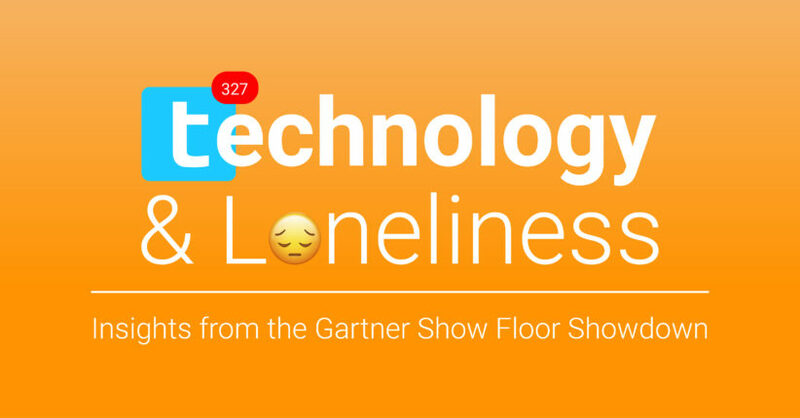 According to the data, approximately 45% of respondents thought technology was a major reason for loneliness. Though this sentiment was captured in the survey, a closer look revealed a much more complex relationship between technology and loneliness. We decided to analyze how people use technology to connect with others in tangible ways by zeroing in on a specific scenario: how often respondents used technology to communicate with their families. We discovered an interesting effect, where 23% of respondents who were always lonely used technology to communicate with their families every day, yet 25% of respondents who were never lonely also used technology to talk to their families every day. Further the greatest percentage of respondents who were never lonely (29%) used technology to communicate with their families a few times a week. Based on this information, the question of technology’s impact on loneliness was more complicated than it first appeared. Though people perceived technology as a negative influence on loneliness, people who were never lonely also tended to use technology to connect with their family members at least a few times a week. So what was going on with this divide? To gain some clarity, we leveraged AnswerRocket’s machine learning capabilities to identify drivers behind the data. That is, AnswerRocket analyzed data relationships and patterns to identify the causes behind the numbers on the surface. We found that location played a much larger role in loneliness than we would’ve guessed. The largest role in fact, with Ohio leading the charge for loneliest respondents. Other factors, like the amount of personal confidants and attendance of religious services, also impacted loneliness. These drivers, working in the background and influencing the participant’s responses, built a more complete picture of loneliness and how technology isn’t the sole, or even most important, factor. The relationship between technology and loneliness doesn’t exist in a vacuum, and AnswerRocket was able to quickly pinpoint the other factors that exhibit stronger correlations. Now, that’s a lot of info to pack into a 10-minute presentation. Imagine what we could illuminate about your company. To get a sample of AnswerRocket’s industry-leading AI-powered analytics, sign up for a custom demo. We’ll work with your data! We’d love to learn more about your business. 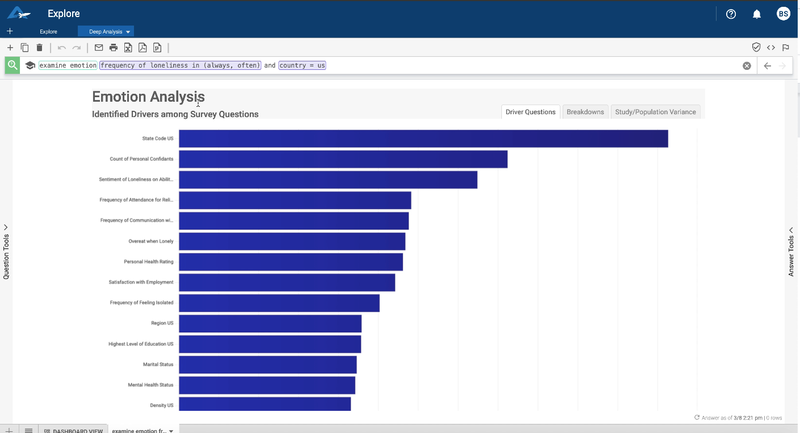 Take AnswerRocket for a test drive to see our bottom-line impact.